When I found out that one of my favorite bloggers, Richa of veganricha.com, was writing a cookbook, I was so excited to see what she would come up with. I’ve been a regular reader for years and have always had luck with cooking from her blog, which is updated often and also really gorgeous to look at. she’s a great photographer: All of her food is gorgeous, but I especially love Richa’s epic, towering and bold burgers … take a look! I can always spot her trademark photography style on social media channels right away. But back to her cookbook! 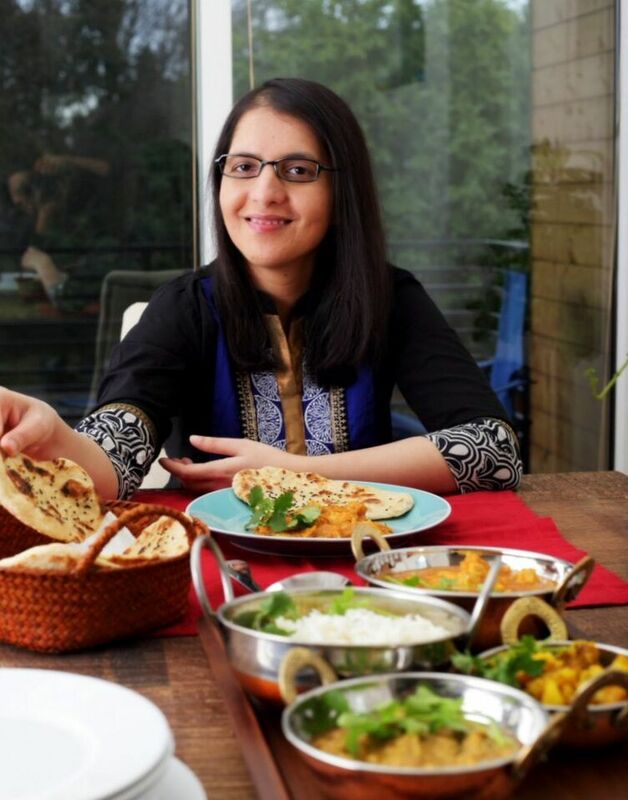 With VRIK, Richa has taken traditional and sometimes time-consuming Indian dishes and has not only made them vegan, but also more simplified, and quicker to make, with authentic or close-to-authentic results. 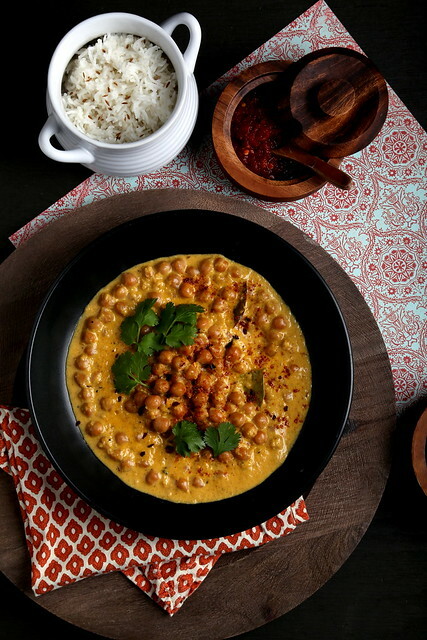 Some of the dishes in the cookbook include savory lentil pastries, roasted cauliflower and radish, split pea soup with spices and coconut, South Indian chickpea eggplant stew, butter seitan curry, vegan paneer and spinach in tomato sauce, saffron cream fudge and Bengali saffron cheese dessert. VRIK also includes spice blends, Indian breads, several chutneys, as well as sauces and basics. I started off with making Richa’s Mango Curry Tofu (I subbed chickpeas which is a suggestion provided in the recipe) and we both loved it! I actually loved it more because while making it, I got to experience standing over the pot and smelling its heavenly aroma while it simmered. Sweet mango puree is mingled with rich coconut milk that’s balanced out with a small hit of apple cider vinegar and scented with cayenne, cinnamon, Garam Masala and cumin. The winner of this giveaway is Shelley, congrats! Thanks to everybody who entered! Mangoes are abundant in India, where they are always juicy and sweet. In the United States, mangoes can be a bit tart. For desserts or curries like this one, I prefer mango pulp or puree in canned or bottled form. You can use a ripe mango, if you prefer, but be sure to puree it well before using. This is a simple recipe but the resulting dish is very alluring with its sweet and spicy sauce. It can easily be made soy-free with 2 cups of soaked chickpeas. Cut the tofu slab into 1/2-inch slices. Place them on a clean kitchen towel. Cover with another kitchen towel. Place a 10-pound (approximate) weight on top and let sit for 10 minutes. Alternatively, you can use pressed tofu. Cut the tofu slices into 1/2-inch cubes. In a blender, combine the onion, ginger, and garlic and blend into a smooth puree with 2 tablespoons of water. Heat the oil in a large skillet over medium heat. When the oil is hot, add the cumin seeds, bay leaves, and cloves. Cook for 1 minute. Add the pureed onion and cook until the onion mixture is dry and does not smell raw. Stir occasionally to avoid sticking, 13 to 15 minutes. Add the coconut milk, mango pulp, salt, and vinegar and mix well. Add the tofu and all the spices from the tofu skillet to the sauce skillet. Add a dash of black pepper. I love Gobi Manchurian at our local Indian restaurant. Manchurian sounds more Chinese than Indian though doesn't it?? But I've always been afraid to try cooking Indian at home. Richa's book might be just the thing I need! I, too, love Richa's recipes and would be thrilled to to have her book! Curries are my favorite – all that yummy sauce. This one with mango sounds great. My email is djsstubbs@aol.com. I love all forms of dal. Dal makhani, tarkka, etc. But I have to make this mango curry immediately. I love Richa's blog and recipes. I think I might of had a small complaint (like once I remember she didn't write to preheat the oven, and I had to wait an extra 20 minutes to the oven to heat up, but then again I should of read the recipe all the way) I can't wait to look at this book and see all the different recipes. I've never met an Indian dish I didn't like! Would love to try making naan and paratha. We are fortunate to have the Karma Cafe in Salt Lake City. The owner serves one entree each night, prepared as Indians would at home – not restaurant style. Simple, satisfying, and delicious. Thanks for the giveaway! My favorite might be dosas. There isn't a restaurant near me that serves them so they're always a real treat. It would be great to learn how to make them! I love one of Vegan Richa's Massaman Curry Vegetables recipe. Anything curry trips my trigger. Thanks for the chance to win this cookbook! I love Indian food and tried Malai Kofta for the first time the other day. That, along with the garlic naan was a wonderful meal! Now, If I could just find a vegan version of this vegetarian recipe that would be great! Who knows, maybe she has one in this cookbook?! Tofu saag & vegan naan! Thanks to Gokul is St Louis. Aromatic chickpea and spinach curry! Love any dish with chickpeas, lentils, spinach or eggplant! I really love all the creamy Indian sauces which I've had to forego since finding veganism. Richa is a wonderful person who has helped me figure out Indian ingredients, recently she directed me to chickpea flour for some vegan omelettes. I would really enjoy holding her book in my hands. I really like the eggplant dishes! I'm a huge fan of saag aloo. I make it at he pretty often! as much as i wish i did not, i adore pakoras! thanks for the giveaway! dosas! saag with coconut milk! baingan bartha! I love anything Indian and vegetarian / vegan; would love to win a copy of this! I love Chana Masala and Naan. I am a huge fan for her recipes and her blog! So excited for the cookbook. Always nervous about making Indian food for my son, because I worry he won't like it! I LOVE any paneer dish but paneer makhani is amazing with roti and a coconut dal. I love a paneer dish but paneer makhani with roti and a coconut dal is to die for. Saag with tofu, curries are wonderful too. I just love Indian food! As much as I love saags and curries, I'd have to say my favorite Indian dish is vegan Nav Ratten Korma. Thanks for the recipe and the opportunity to win! i am such a fan of indian food and i'm lucky dw loves it too. we are limited in ordering it out because of the use of milk/cream/butter. i love vindaloo but it has been years since i've been able to have saag paneer. Masala Dosa is my favorite Indian food! Sorry realized I had to add my email sophie _ 680 At hotmail dot com. Aloo Gobi and Masala Dosas are my two favorites. Dal Makhani!!! I hope she has a vegan version of this recipe in her book. When I was in Rajasthan last year, this dish stole my heart. Of course it's made with cream and ghee in India but I'd love to make a vegan version of it at home. yes, its in the book! Curry, Gobi Manchurian, Palak Tofu Paneer, Dal… so many! my favorite is chana masla. Thank you for the wonderful review Erin! and the gorgeous photos! i am so happy you both loved it! It's my pleasure, Richa … Looking forward to making more dishes from it! My fave indian to order out is aloo gobi with veggie samosas! If im cooking at home i always go for the curries like malai kofta and chana masala! I love Indian butter chicken, but I make it with cauliflower. Thanks for doing the giveaway! I love tofu tikka masala so much! I'd also really like to make samosas sometime. Indian food is one of my favorites, I don't think I've tried anything I didn't like! I'd also love to try making some tofu palak paneer! I'd love to get my hands on her cookbook, everything I make from her is spot on! I love tika masala, and samosas. I love most Indian food, but my absolute favorite is Tika Masala. The flavors are amazing! This looks like a great book for a new vegi person! I love most Indian foods. For me, the winner tends to be Paneer Mahkani or Paneer Tikka Masala. Email is a p o l l y m i @ gmail.com. I love Indian food as a whole, but if I had to pick… Aloo Gobi and Saag Paneer are my comfort foods. Any type of curry – ANY – love. I never pass up a good Channa Masala either. Me, my sister and brother-in-law are addicted (no lie) to Vegan Richa's jalapeño popper dip! I would so enjoy and use and batter her cookbook! Bhaigan Bhartha, as I am a sucker for eggplant anything. But Channa Saag is a very very close second!